Custom loaded 6.5mm BRM ammo, 20 rounds in a re-usable plastic carrying case. EABCO Custom 6.5mm BRM Brass, loaded with VihtaVuori powder, Benchrest Primer, and Amax match grade hunting bullet. Yes... The best components yield the best accuracy. 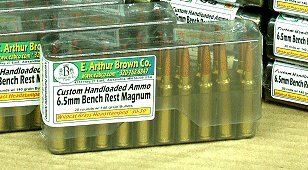 This ammunition fits and fires in the Model 97D Rifle as well as Custom TC Encore Accuracy Barrels. Shoot all you want... We'll make more!